Pauline Kaldas was born in Egypt and immigrated with her parents to the United States at the age of eight in 1969. She spent her first eight years in the Cairo suburb of Mohandessein with her parents, grandmother, and aunt. When her family immigrated, they settled in the Boston area. She attended Clark University in Worcester, MA, where she majored in English and Business. She went on to receive her M.A. in English at the University of Michigan and her Ph.D. in English and Creative Writing at Binghamton University. After receiving her M.A., she moved to Providence, RI, where she taught at Rhode Island College and Rhode Island School of Design. In 1990, she went to Egypt with her husband, T.J. Anderson III, and they spent three years teaching at the American University in Cairo. Those three years gave her the opportunity to re-connect with her family and immerse herself into her culture. It was a period of intense artistic and personal growth. She returned to Egypt again in 2002 with her husband and two daughters for six months when her husband was awarded a Fulbright to teach at Cairo University. Their most recent trip to Egypt was in 2010. She is the author of Looking Both Ways, a collection of essays (Cune Press, 2017), The Time Between Places, a collection of short stories (University of Arkansas Press, 2010), Letters from Cairo, a travel memoir (Syracuse University Press, 2007), and Egyptian Compass, a collection of poetry (WordTech Communications, 2006). 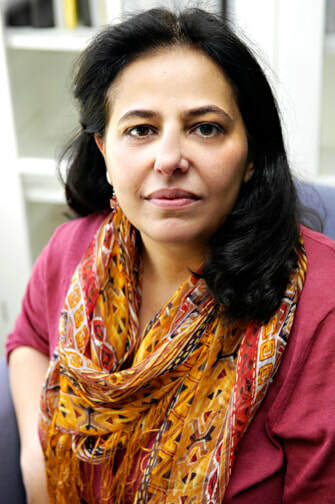 She also co-edited with Khaled Mattawa Dinarzad’s Children: An Anthology of Contemporary Arab American Literature (University of Arkansas Press, 2009). She was awarded a fellowship in fiction from the Virginia Commission of the Arts and has been in residency at the MacDowell Colony and the Virginia Center for the Arts. Pauline Kaldas is currently Professor of English and Creative Writing at Hollins University in Roanoke, VA.